Basil is usually abundant in the summer months. This past winter, I found quite a lot of fresh basil in the grocery stores. 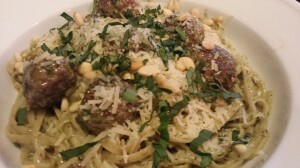 My Creamy Basil Pesto Pasta with Turkey Meatballs was just the ticket for a nice “green” Saint Patrick’s Day meal. You could use spinach pasta for a greener hue. It wasn’t really a green dish though. Adding a bright green pesto to a creamy chicken-stock-based sauce turns kind of taupe in color. But it sure tasted good! I guess I could have added some green food coloring to the sauce, but that would be weird. I like to make my own pesto. It’s usually a combination of an herb such as basil or oregano, some pine nuts, grated Parmesan cheese, olive oil, and some salt and pepper. You can make your own or substitute store-bought pesto. 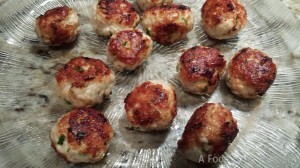 Make my Easy Turkey Meatballs and set aside. You’ll need 12 – 18 of the turkey meatballs. 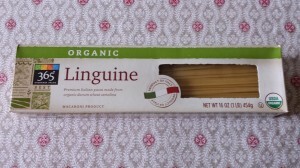 Then prepare some linguine pasta and cook it according to the package directions while you are preparing the rest of the dish. 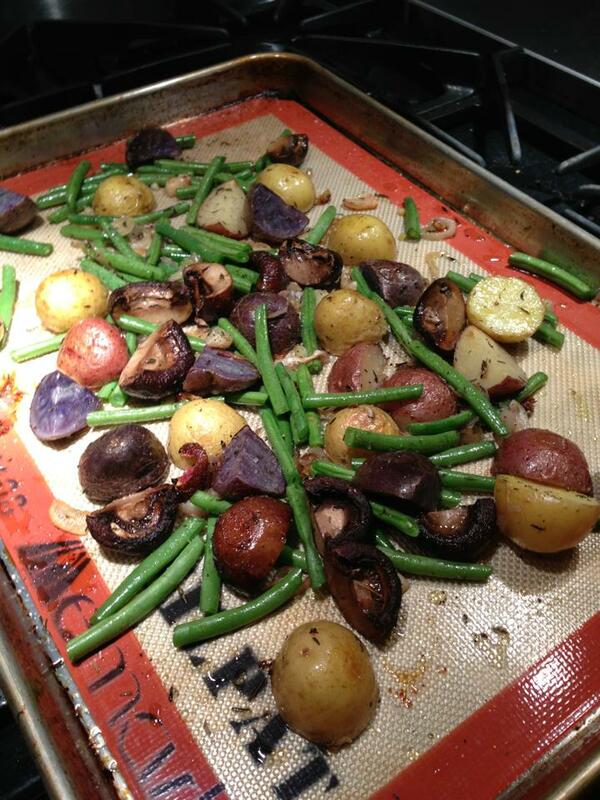 Then warm some olive oil in a non-stick pan. Saute some chopped onion and minced garlic. Add some chicken broth/stock and let cook a bit. Then add some heavy cream and some grated parmesan cheese and let it reduce a bit. Add the meatballs to the pan and warm through. Then add the basil pesto and stir. 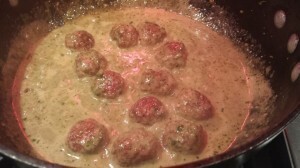 Remove the meatballs to another dish with a slotted spoon and set them aside. Add the cooked and drained linguine to the sauce. Toss the linguine pasta in the sauce, and divide amongst your serving plates. Top the pasta with the meatballs. 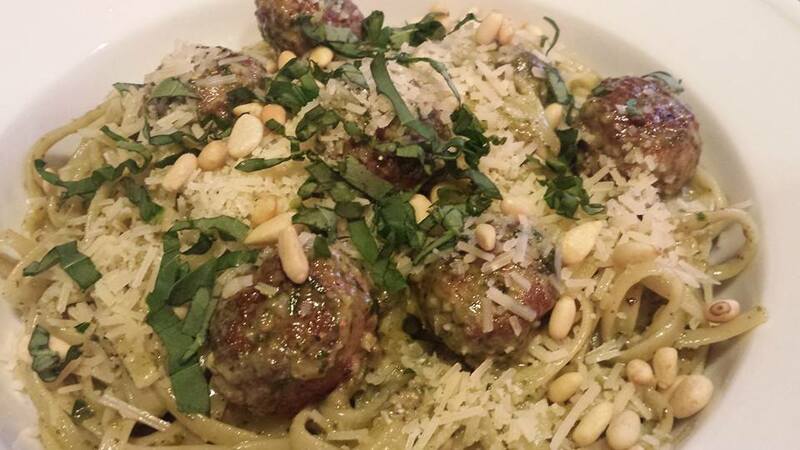 Garnish with toasted pine nuts, shredded Parmesan cheese, and chopped fresh basil. 1. Make and cook the meatballs according to my Easy Turkey Meatballs recipe. Set aside and keep warm. 2. Cook pasta in boiling water according to package directions while you are making the rest of the dish. Drain, set aside and keep warm. 3. Warm the olive oil in a non-stick skillet over medium heat. Saute the onion until it’s translucent and soft. Add the minced garlic and cook a minute or two. 4. Add the chicken stock to the sauce and let the sauce cook down a bit. 5. Reduce the heat to medium-low. 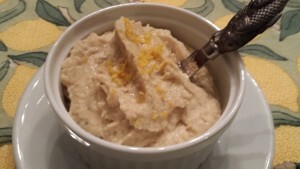 Add the heavy cream and grated Parmesan cheese and let the mixture reduce a bit. 6. Add the cooked meatballs to the sauce and heat through to warm the meatballs. 7. 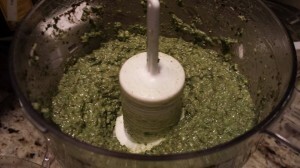 Stir in the basil pesto. Let cook another few minutes. 8. With a slotted spoon, remove just the meatballs to a plate and set aside. 9. 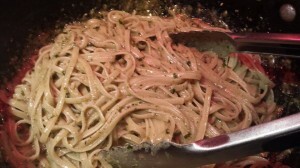 Add the cooked and drained linguine to the sauce in the skillet and toss it. Plate the pasta on serving plates. 10. Divide the meatballs amongst the pasta on the plates. 11. Top the pasta and meatballs with the pine nuts, shredded Parmesan cheese, and chopped basil. Serves 4 as a pasta course, and two as a main course. Offer toasted garlic bread alongside the pasta. Variations: Try a spinach-based pasta for a greener hue. Use beef or pork meatballs instead of turkey meatballs. Use an oregano pesto instead of a basil pesto. Use a different pasta such as penne or spaghetti. 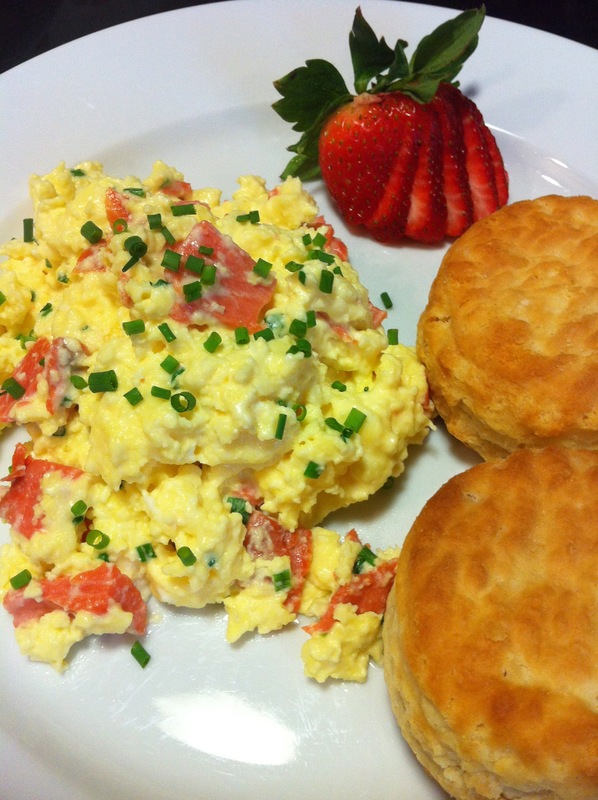 You can substitute a couple spoons of Greek yogurt for the heavy cream. Just watch that the sauce doesn’t curdle.